By adding Muvi Kart to your website you can sell goods related to your content (Such as, Movie Merchandise) or you can also set up a separate store where you can sell various items including electronics, apparel, books, digital content and many more like any other online store. (Note: We charge 0.5% of transaction) You can add item to your online store, check the order status, add shipping cost, restrict country/countries where you don't want to ship your product, offer free goods on checkout and also keep track of your revenue generated from selling goods in your online store with our “Revenue Analytics” feature. 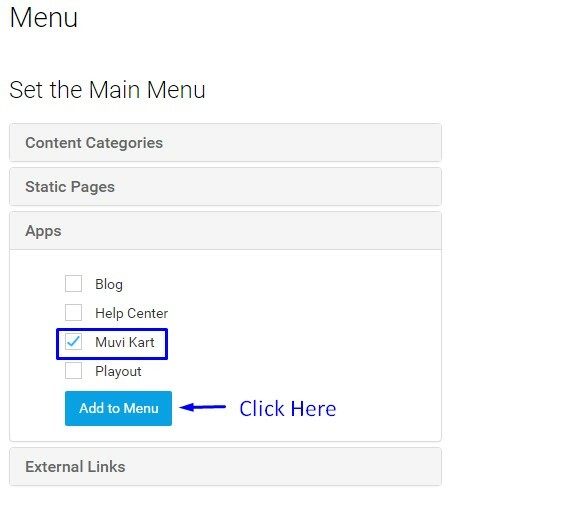 To add Muvi Kart to your website, first you need to activate it. To activate Muvi Kart go to “Marketplace” -->“Manage Apps” in your CMS. Click on “Activate” under “Muvi Kart”. When you click on “Activate” a window will open with “Yes” and “Cancel” option. Click on “Yes” to activate. Once the Muvi Kart feature is activated, you can see it in your CMS menu. Before adding Muvi Kart to your website, first you need to add a Payment Gateway. Otherwise you will not be able to add Muvi Kart. Muvi Kart is enabled for Physical Only, Modern, Revo and Classic Template. After activating your Muvi Kart, it’s now time to add items to your online store. To add items to your store, go to “Manage Content” --> “Content Library” in your CMS. In "Content Forms" field, select "Muvi Kart Form" from the drop-down list(See Below Screenshot). Click on "Add Content" to go to Add Content page. "Item Permalink" will be automatically generated. You can also edit the Item Permalink. In the “Price” field, mention the price of the item. Here you can select multiple currencies for the item. Type the Stock Keeping Unit (SKU) number in the “SKU Number” field. It is a unique number for each item. In the “Status” field select, “Active”, “Inactive”, or “Out of Stock” from the drop down menu. If you have enabled Personalization, then select Enable or Disable option. If you will select the Enable option then the product can be customized by the end user. On the right hand side of the page under “Upload Poster”, upload an image of the item. You can add multiple images for an item. Simply click on under poster to add any additional image related to the product. To remove a poster simply click on the "X" on the image. Finally, click on “Save” to add the item to your store. Once the items are added to your store, your customers can see them when they visit your website. If you have added a standalone Muvi Kart store, then your customers can see the displayed items like normal online store. (See Below Screenshot). Here they can click on “Order Now” or “Add to Cart” to purchase the item like they do in normal online shopping. You can link an item with a specific VOD content. When users will click on the content they will see the item in the content details page. Users can click on the item displayed in the content details page to purchase it. This is useful when you want to sell movie merchandise. For example, Spider man T-Shirt, Superman Cap, Star Wars DVD etc. To add an item to a content, select "Link to Content" in "Item Type"
Fill up the other fields for the item and click on "Save"
The item will be linked to the content. When the users click on the content, they will see the item in the content details page. Note: Link to content is only enabled for "Classic Template" and"Traditional Template". Users can only view the item linked to the content if you have activated one of these templates. You can add a preview or trailer of your product. You can upload the video from your computer or upload from Video Library or Embed a third party video link. In the content type select "Physical"
To change the Preview/Trailer, click on "Change Video". Select the preview from the computer/video library/Embed 3rd Party. To remove the trailer/preview, click on "Remove". When asked for confirmation, click on "Yes" to remove the trailer. Once the Preview/Trailer of the product is added, users can view it by clicking on "View Trailer" on the item details page. You can add a default shipping cost to all your items. When your customers will purchase any item from your online store the shipping cost will show separately under the item cost. Here you can also set shipping cost in Multiple Currencies. To add default shipping cost please go to “Muvi Kart” --> “Shipping” in your CMS. Under “Shipping Rules,” select the check box for "Default Shipping Prices". Mention the amount in your default currency (If you have set multiple currencies for your website then you can add multiple "Default Shipping Prices" in different currencies). You can allow the shipping of your product to particular country/countries. To allow shipping to particular country/countries please go to “Muvi Kart” -->”Shipping” in your CMS. 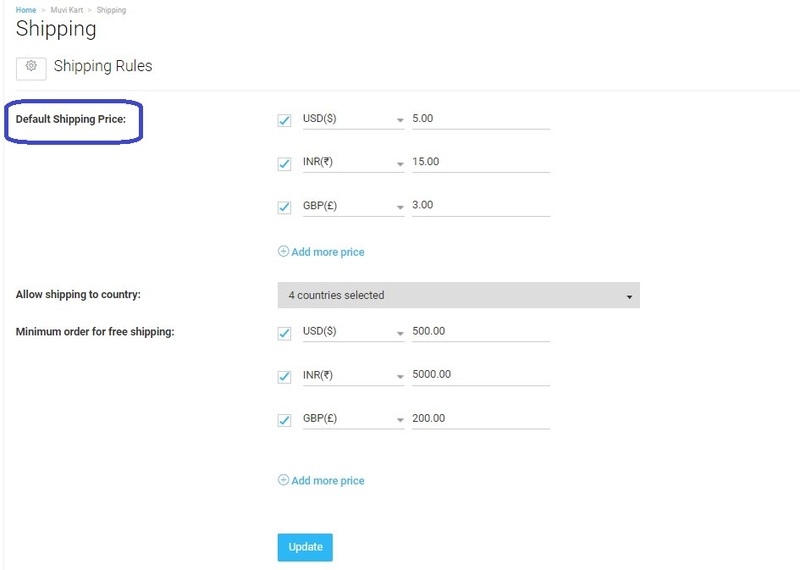 Under “Shipping Rules,” in “Allow Shipping to Country” field, select the country/countries from the drop down menu. Finally, click on “Update”. (See Below Screenshot). You can set minimum order price for FREE shipping. Set a minimum price for which you can offer FREE shipping to your customers. (For example, if you set minimum order price $200 for free shipping, when a customer buys goods from your store more than or equal to $200, then he/she will get FREE shipping for the order). Here you can also set minimum order price in multiple currencies. To set minimum order price for FREE shipping, please go to “Muvi Kart” -->”Shipping” in your CMS. Under "Shipping Methods & Product Sizes" ( “Muvi Kart” -->”Shipping”), you can define different types of shipping methods (i.e. Standard, Express) and product sizes (i.e. Small, Medium, Large). These values will be displayed while you will add an item to Muvi Kart. Type a name for the Shipping Method and click on "Add". The shipping method will be added to the list. To edit a shipping method, click on the edit icon. To remove a shipping method, click on the trashcan icon. When asked for confirmation, click on "Yes" to delete the shipping method from the list. Type a product size name ( i.e. Small, Medium, Large) and click on "Add". The product size will be added to the list. To delete a product name from the list, click on the trashcan icon. When asked for confirmation, click on "Yes" to delete. You can add different shipping price for different countries. 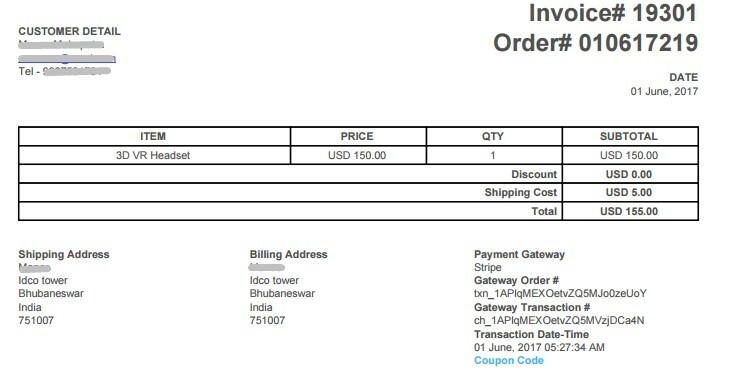 So, when a customer selects a country form the drop down list in your website and place an order, he/she can see the shipping price for that country only. Also, you can define shipping price according to "Shipping Size" (Small, Medium, Large) and "Shipping Method" (Standard or Express) for a specific country. Note: To add "Shipping Size" and "Shipping Method" you need to add a support ticket. Under "Shipping Costs", click on "Add Shipping Cost"
Repeat the process to add different shipping price for another country. If you wish you can Edit or Delete the shipping price that you have already added for a specific country. To remove the shipping price of a specific country, click on "Delete" button under "Action". When asked for confirmation, click on click on "Yes" to delete the shipping price. To edit the shipping price, click on "Edit" under "Action. Make the necessary changes and then click on "Update"
As per your wish or as a promotion of your website, you can offer some selected item/items as FREE gift to your customers at the time of checkout. So, when the customers’ checkout they can get the item/items free of cost. To enable free offer, please go to “Muvi Kart” -->”Settings” in your CMS. Under “Free Offer”, select the check box “Enable Free Offer on Checkout” option and then type the item name on the search bar. The item will be added to your free offer list. You can add single item or multiple items. Finally, click on “Update”. By enabling Kart Geo-Block, you allow your customers easily switch countries for viewing and ordering products available in their home country while accessing the website from a different country. 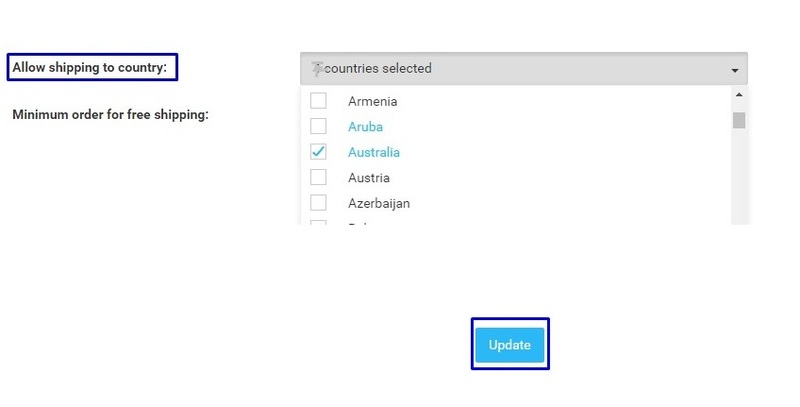 When you enable this option, in the front-end your customers can select the country of their choice from the drop-down menu (In the drop-down, only users can see the countries which are added in Allow Shipping to Country). They can only view the items those are available for their country and place order. To enable "Kart Geo-Block", go to "Muvi Kart" --> "Settings" in your CMS. Select the Geo-Block category from the list and click on "Save". 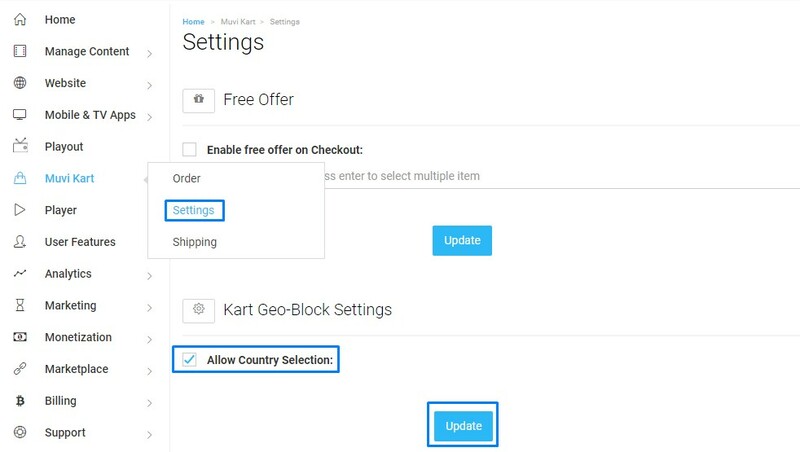 Once the Kart Geo-Block is enabled, your customers can select the country of their choice from the drop-down list on your website. (See Below Screenshot) The item/items blocked for the selected country will not be displayed on the shopping cart. Note: Customers can view this option only if you have activated "Physical Only" template. In other templates (Classic, Traditional and Modern) customers cannot view this option. When users visit your store, they can purchase the items of their choice. To purchase an item, they need to click on the "Explore" to view the item details. If the user clicks on "Add to Cart" then the item will be added to his/her cart. Users can also mention how many items they wish to purchase. Then they have to click on "Checkout"
They need to fill up their shipping address details and select the shipping size. Next, they have to put their credit card information. Finally, they have to click on "Confirm Order"
The order will be placed. Users can view their order details in the "Purchase History"
Note: When users click on "Add to Cart" in the website, it will also reflect in the cart of their mobile app and vice versa. Once your customers placed the order, you can view its status in the “Order Screen” page. 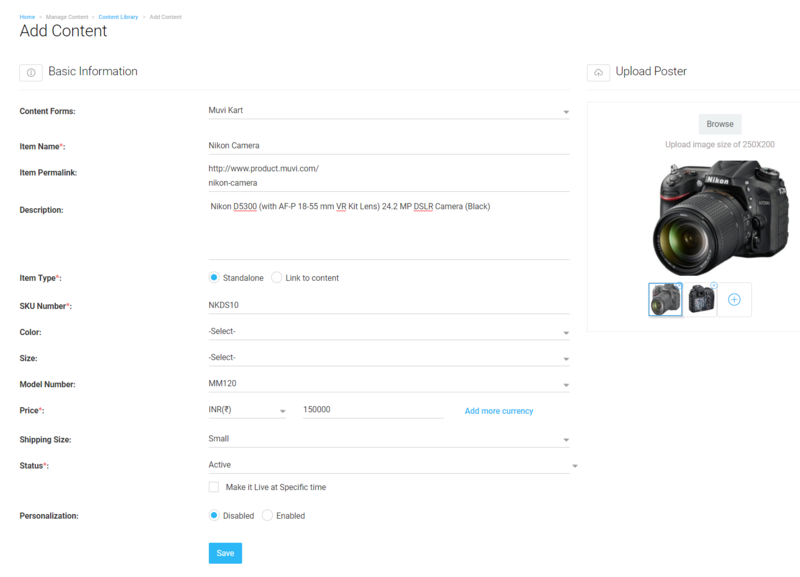 Here you can also manually edit orders (Add/Delete Items, Update Shipping Address and View Payment Information). To view the order status, go to “Muvi Kart” -->”Order” in your CMS. Here you can see different columns to view the order status, such as “Order Number”, “Date”, “Customer Name”, “Item Name” and “Total Amount”. There is a search bar where you can search a particular item to see its current order status. You just need to type the “Order Number”, “Customer Name” or “Item Name” in the search bar. To edit an order click on the "Order Number". You can download order status in CSV format. In the "Order Screen", click on "Export to CSV"
All the order status will be downloaded in MS Excel file. Your customers also can view the status of their orders by clicking on the “Purchase History”. However, they have to first login to your website to view the purchase history. (See Below Screenshot). You can view the items you have already added to your Muvi Kart store under Content Library. Here you can also edit a specific item as per your requirement. Here you can view all the items you have added to your store. To find a specific item, you can use the filtering and sorting options available. To edit a specific item, click on "Edit Item" on the extreme right-hand side of the item. Make necessary changes and click on "Update"
You can add Shipping Status, Tracking Codes and Tracking URL to a specific order. The Shipping Status and Tracking Code will be visible to the end user in his/her purchase history. The end user can click on the tracking code which would redirect him/her to the courier service. You can also update the Payment Status, and check the transaction reference on order page to verify or refund payments from the gateway. On the next page click on "Change Status". A window will open. In "Tracking Code" field, type the tracking code of the item. If the user has ordered multiple items and the shipping address is same then select the check box "Copy to All Items" to give the same Tracking Code to all items ordered by the user. Finally, click on "Save" to save the changes. You can view the revenue generated by selling goods in your online store for a particular period of time or by selling a particular item. You can also view the graphical representation of your revenue report. To view your revenue report, go to “Analytics” --> “Revenue” in your CMS. Then click on “Physical Items”. (See Below Screenshot). Select the time period from the calendar to view revenue of a particular period. On the right hand side of the page you can see the revenue graph. By looking at the graph you can easily know how much revenue you have generated for a particular time period or by selling a particular item. By clicking on “Download CSV”, you can also easily download the revenue report in CSV format.